During the Teresa 500 Year an icon of Saint Teresa will be present at major events in Britain, and feature on a prayer card. 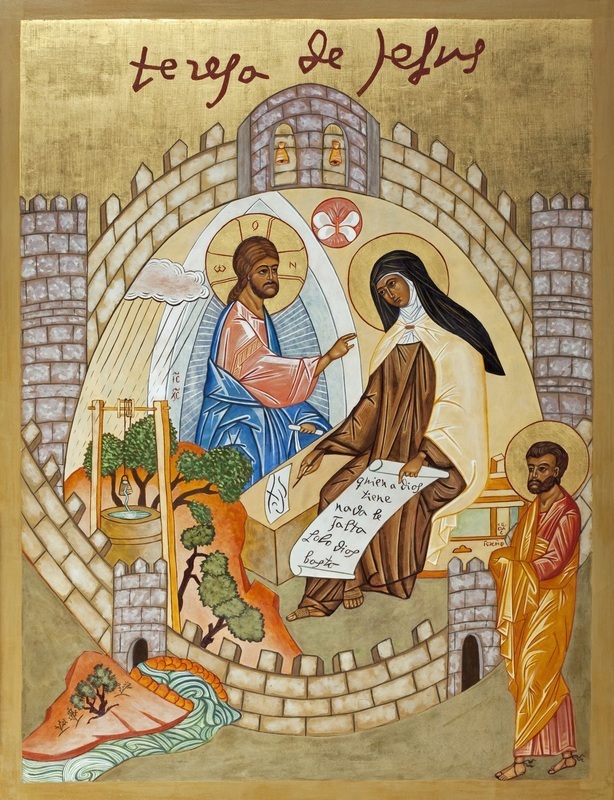 The icon has kindly been lent to the Carmelite Forum of Britain & Ireland by Julienne McLean, a psychologist and spiritual director with a particular interest in Teresa's spirituality. The icon was commissioned by Julienne and painted by the Melkite sisters from the Monastery of the Annunciation in Nazareth, Israel, in 2005. Copies of the prayer card can be ordered by contacting us here. The icon describes, in symbolic terms, the 'interior castle' of our soul, where 'the secret union, or spiritual marriage, takes place in the innermost centre of the soul, where God Himself must dwell' (Interior Castle, Seventh Mansions, Chapter 2, 2). Above the symbol of the spiritual marriage, and within the castle, a butterfly can be seen; St. Teresa used the symbol of the metamorphosis of a silkworm into a butterfly to describe the journey of spiritual transformation (Interior Castle, Fifth Mansions, Chapter 2). A section of the famous prayer of St. Teresa, in Spanish, is depicted on the scroll in her hand: "Let nothing trouble you, let nothing frighten you, all is fleeting, God alone is unchanging, patience obtains everything, who possesses God wants for nothing, God alone suffices." In the lower left hand section the four waters of prayer are depicted through symbols of how a garden is watered and different ways of drawing water. The early stages of prayer are depicted by either the laborious work of drawing water from the well or the slightly easier method of using a water wheel and buckets. The third and fourth waters, or the interior dwelling places of prayer, are depicted by a stream running through a garden or by 'heavy rain, when the Lord waters it himself, without any labour of ours' (Teresa's autobiography). The figure in the lower right hand section is St. Joseph, towards whom Teresa had a particular devotion, and her signature is depicted across the top of the icon. This description is from Julienne McLean, Towards Mystical Union: A Modern Commentary on the Mystical Text 'The Interior Castle' by St. Teresa of Avila, (London: St. Paul's, Second Edition 2013).